So today started with another bowl of PB&J&B Oatmeal. I have some serious DOMS (delayed onset muscle soreness) happening from yesterday's workout. Wow. Good thing today was legs. I used the drop set method again for everything except calves: 12, 10, 8, 6. After my workout, I did just half of Shock Cardio HIIT Pyramid and Yoga-style abs from Abs Circuit then stretched. It's rainy, cold, and dreary here today. I had wanted to bake some bread and do some other cooking today. However, the oven is broken so that didn't happen. I did manage to get lots of laundry done, Jason vacuumed the area rugs, and I swiffered up the doggy dust bunnies. I also tried straightening up and organizing the room that I am now using as my weight room. This house had once been a duplex and that particular room was a kitchen. There are tons of holes in the walls from where the cabinets had been hung. So, I got those filled in finally (we've been here 9 years by the way). Next is to repair the cracks in the plaster from having the house leveled. Then I get to paint it. I want something bright and happy for the weight room. We have lots of yellow/gold tones on the walls so Jason is afraid of another yellow, but I think yellow would be cheery. You need cheery doing weights! What would you pick for your exercise room? Even though I didn't have an oven, I still opted to make up some veggie cakes based on the ones I had at Cafe 1217 when we went to the races a while back. I have a fairly good toaster oven that I used. It just took a lot longer to make all the "cakes" as I could only cook off 3 at a time. The veggie cakes that I had at the restaurant tasted to have been made with sweet potatoes and zucchini. So I used that as a starting point for my Quinoa Veggie Cakes. I served with a Red Bell Pepper Coulis and Barley Veggie Salad. In large bowl, smash potatoes, then stir in all ingredients minus the flour. Slowly add in the flour until desired firmness. Form into patties and bake on a prepared baking sheet approximately 1 hour flipping once. In food processor, puree cashews and 1/2 cup water to. Add in remaining ingredients and continue to puree until smooth, adding more water if needed. On the side we did a Barley Veggie Salad that consisted of some leftover pearled barley, red kidney beans, yellow bell peppers, peas, minced red onion, diced tomatoes, champagne vinegar, salt, pepper, parsley, basil, garlic powder, and a basil tomato spice blend. I'll say that these were absolutely better than the ones we had at the restaurant, and I'm not just bragging. The Red Pepper Coulis was a great sauce that helped to offset some of the sweetness of the "cakes". We will most definitely be making these again. The next time I think I'll try adding in some chickpeas for additional protein. Another side option would be a slaw. Sounds great Heather. Thanks so much for sharing. 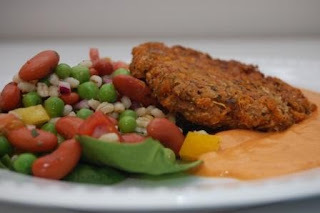 I love the quinoa cakes and your sauce. I have no idea what color to paint the weight room. Mine is white, not very inspiring. If Jason doesn't like yellow what about a nice vibrant green? Hey Alicia @ Vegan Epicurean we do have a room we just painted a very light, vibrant green so maybe a shade off from that would work. I'm still shooting for a yellow though! It's mostly my room anyway LOL. Thought he has started lifting again this past week. Looks like a great meal!! I am definitely buying quinoa at the store next time I shop. I've never had it before. Another first for me! I'm always looking for new ways to use quinoa! Thanks for sharing! Looks terrific Heather! I will definitely copy and make this later next week (my menu is already set for this week). My workout room is a bright yellow with a bit of orange in it- I wanted something high energy! You are so sweet. Thanks so much for the encouragement on my blog today. My husband tells me the same thing all the time. Girrrrl you are a recipe goddess! these cakes sounds AHHmazing! I hope you had a great weekend despite the soggyness! xoxo! Lauren @ A Fit Foodie Quinoa is definitely a must try! It's super easy to make and very versatile. Anna @ Newlywed, Newly Veg I was actually quite pleased at how well it worked in a patty. Hope you give it a try. Patti thanks so much for stopping by!! There is a bedspread shown in BH&G Magazine that has yellows, oranges, and greens and I love the combo. Very high-energy. 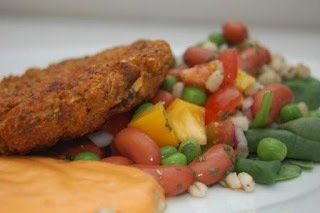 Let me know how the veggie cakes turn out for you! FitLizzio I have a love/hate relationship with leg workouts. I usually dread them until I get going. Hey Lizzy hope your weekend was a good one too. How'd the veggie grill out go???? YUM YUM YUM...need i say more? yeah for PBJ oatmeal! so good. those cakes look really good and the recipe sounds simple. i totally forgot about replacing eggs with flax, thanks for the reminder! Thanks Kelly @ Healthy Living With Kelly ! Hi Janetha @ Meals and Moves ! Thanks for stopping by. It really was a simple recipe. I'm all for simple! Wow, those veggie cakes sound amazing! Hi Joy R3FitShow ! Thanks so much for stopping by. I have a lot of catching up to do on your blog! Found you on twitter too.